You are looking at a Freshly Converted Volkswagen T5 “Coastline” Camper with the very desireable 1.9 TDI Diesel Engine!! It has covered 130k and comes with Full service history with part main dealer history. These engines are really just getting worn in at 130k and will go on and on, with impeccable Volkswagen reliability. It has just had a service under 1,000 miles ago. 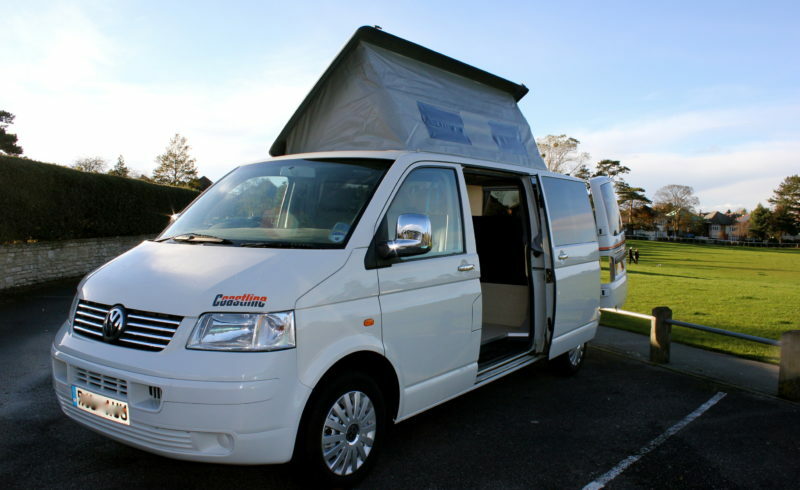 It is fully equipped campervan with a rock ‘n’ Roll bed and poptop roof. It is Newly Converted and has not been used yet with all new Appliances . It has a 3 way fridge, twin hob’s, Brand New leisure battery, Running water (Fresh water and waste tank) 12v Lighting, Electric mains hook-up, External Gas connection for use with a gas barbecue, detacheable table and masses of storage space. The cambelt was changed at last main dealer service in 2009. It also had a new turbo, new clutch and a new battery fitted this year. If you would like any more information or you would like to arrange a viewing please don’t hesitate to drop us an email or give us a call, we would be more than happy to help.